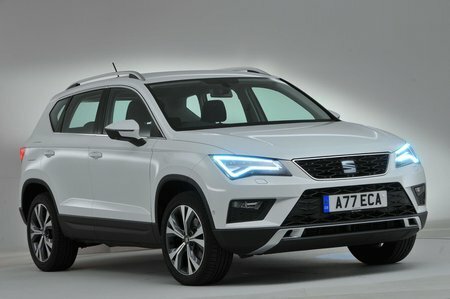 Seat Ateca Interior, Sat Nav, Dashboard | What Car? 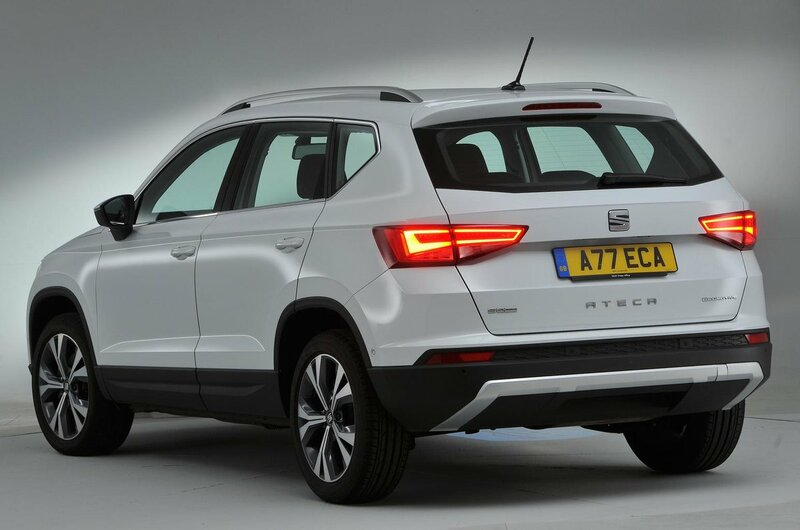 In addition to being great to drive, the Ateca is at the top of its class for driver comfort. There are a wide range of adjustments to both the steering wheel and seat, plus most models receive adjustable lumbar support as standard. 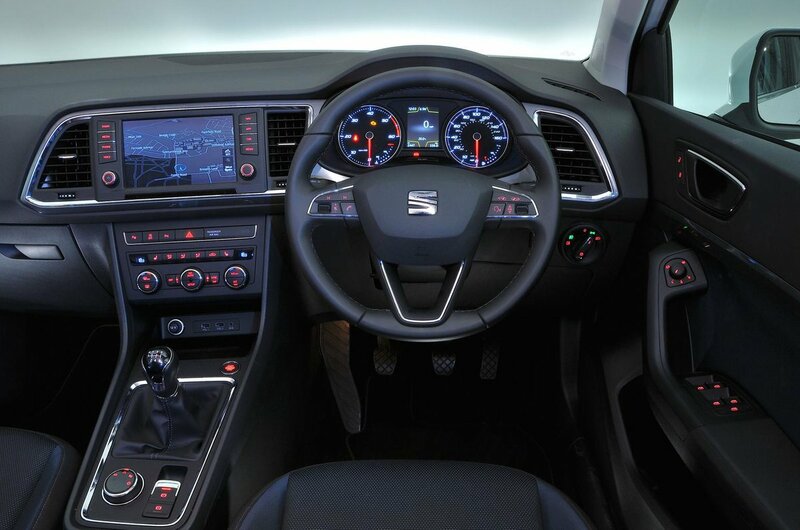 The pedals, seat and steering wheel are nicely aligned, helping to keep you relaxed on lengthy trips. In keeping with the sporty image, the seats in all models have more side support than those in many competitors. This means you don’t find yourself hanging onto the steering wheel to avoid sliding around through bends. And, with the exception of the S trim, you get an armrest between the front seats that makes for comfy cruising. Thanks to its high-set driver's seat, the Ateca gives you a great view down the road. And its windscreen pillars aren’t too thick, so pulling out of junctions isn’t merely an act of faith. But while over-the-shoulder visibility is better than some rivals, those kicked-up rear windows do block some of your view out of the back; the Skoda Karoq’s larger rear-quarter windows make it better in this respect. Fortunately, SE models and above come with rear sensors to help with parking. There’s also the option of a reversing camera or even a bird’s-eye-view camera, which makes it easy to see how close you are to obstacles. You can have a self-parking system, too. Full LED headlights are standard on SE Technology trim and up. These are much better than the halogen units you get on the cheaper trims. Entry-level S models receive a 5.0in monochrome touchscreen system with an FM radio, USB port, SD card and Bluetooth connectivity. We’d advise going for SE trim at least, though – that's the entry point for a full-colour 8.0in touchscreen that's miles better. SE trim adds voice control and four extra speakers (to make eight in total), but you still don't get sat-nav or a DAB radio. Both of these are bundled together as a reasonably priced option or come as standard on the business-focused SE Technology, sporty FR and top-of-the-range Xcellence trims. We'd prefer a separate rotary dial controller along the lines of BMW’s iDrive than a touchscreen, because the former is easier to use while you're driving. However, as touchscreens go, the Ateca's 8.0in version is easy to get to grips with, thanks to its logical menus and reasonably snappy response times. It's just a pity that the definition of the display isn't nearly as good as it is in some of Seat's cheaper models, including the Arona, or in the Ateca’s sibling, the Karoq. It’s a far better system than you get in a Nissan Qashqai, though. It is worth remembering that SE trim and above receive Seat’s Full Link system, complete with Android Auto and Apple CarPlay smartphone mirroring. Assuming you have a compatible smartphone, you can control some of its features via the car's touchscreen. Meanwhile, wireless phone-charging and a more powerful sound system are optional on most trims. The interior of the Ateca is a match for those of many similarly priced rivals, such as the Qashqai and Kia Sportage. Sure, there are some scratchy plastics on lower surfaces – as there are on any SUVs at this price point – but there’s plenty of soft-touch plastics on the dashboard and door tops, while higher-spec models get attractive piano-black finishes to replace less upmarket matte grey areas. That said, the Karoq, despite being broadly the same and even cheaper, actually feels marginally plusher overall. Most of the buttons and switches are borrowed from other Volkswagen Group products and have an air of integrity to them. Audi is the only exception to this group-sharing policy; the Q2 uses bespoke switches that feel even better to press.